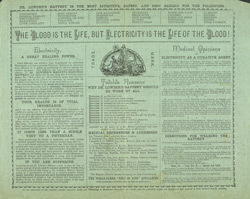 Electricity was still a novelty in the late 1800s and magical and curative powers were attributed to it. There are many surviving adverts for electrical hairbrushes and toothbrushes and this leaflet advertises an ‘Electric Skin Battery’. It claims to help skin disease, tooth ache, rheumatism and even heart disease.